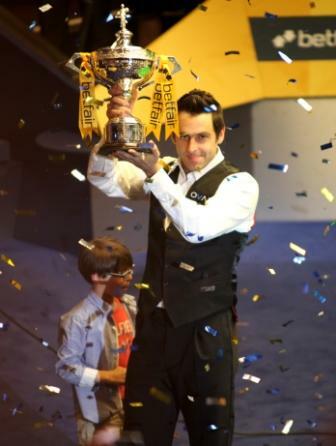 Ronnie O'Sullivan (born 5 December 1975) is an English professional snooker player. He was born in Wordsley, West Midlands. He grew up in Chigwell, Essex and still lives there. He was World Champion in 2001, 2004, 2008, 2012 and 2013. O'Sullivan's first century break made at age 10. He was UK Champion in 1993, 1997, 2001, 2007, 2014 und won the Masters in 2005, 2007, 2009, 2014, 2016. Ronnie O'Sullivan Facts for Kids. Kiddle Encyclopedia.